Apollitical Winga, under jockey Uriel Dominguez, winning the $14,625 Sweetwater Downs Bonus Challenge. ROCK SPRINGS, WY—SEPTEMBER 2, 2018—Apollitical Winga and jockey Uriel Dominguez flew gate to wire to win the feature race at Sweetwater Downs on Sunday afternoon, the 400-yard $14,625 Sweetwater Downs Bonus Challenge (not black type). Final time was 19.783; the winner earned a 98 speed index. The winning filly broke on top and cleared the field by a length at the end of the race, marking her first victory in a stakes race. Previously, Apollitical Winga had competed in the Wyoming All Breeds Racing Association Maturity Stakes in 2018 and the Wyoming All Breed Derby at Energy Downs and the Western States Breeders Derby in Rock Springs in 2017. The 4-year-old daughter of Apollitical Jess was bred in Wyoming by J Bar Ranch 7 LLC, out of the Tres Seis mare Wingalicious. She is trained by Jessie Villegas for owner Pedro Mena. With the stakes win, Apollitical Winga ($7.40) has earned $31,924 in 14 starts, including five wins and three second-place finishes. The post-time favorite, Jrs Blue Boy, broke well but could only chase the winner, maintaining his second-place finish throughout the race to outrun third-place finisher Nowshesfamous by a half-length. Jrs Blue Boy had won four of his last five starts as he entered the gate on Sunday, including the Energy Downs Bonus Challenge in June, in which he broke the track record for 350 yards. 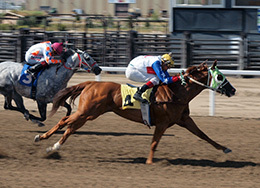 The 5-year-old Fantastic Corona Jr gelding is trained by Riley Moosman and was ridden by Jesus Valenzuela. Allie Sam owns and bred Jrs Blue Boy in Colorado, out of Lil Blue Blitz, by Dash Ta Fame. Nowshesfamous ran third from the outside with Jesus Osuna aboard. Robby Overturf trains for owner Roger Overturf. The 4-year-old filly was bred in Wyoming by Lisa Lozano, by Woodbridge, out of Now a Lady, by Now I Know. Nowshesfamous has five wins in 15 starts, though this was just her second stakes appearance. She was also third in the Wyoming Bred Derby in Evanston in 2017. Completing the field were Mias Irish Dynasty, Queen of the Kartel and Lotta Dynasty.